Located in the heart of a lively area of ​​Trastevere and right next to the river, the apartment is still private and isolated from the noisy nightlife. From here it is possible to reach the main tourist points crossing the bridge: Piazza Navona, Campo dei Fiori, Pantheon, Piazza Venezia. You will also be just minutes from the Vatican City and Castel Sant'Angelo. - From Fiumicino airport take the train to Fara Sabina / Orte, get off at Trastevere station. From there take tram 8 (towards Venice) and get off at Piazzale Sonnino (the sixth stop). From there the apartment is within walking distance. -From Ciampino airport you can take a shuttle bus to Termini station. From Termini take the bus H (direction Dei Capasso) and get off at Trastevere Piazza Sonnino (the 7th stop). From there the apartment is within walking distance. We have a Tourist Office in the city center of Rome named "Welcome in the City" which is in via Ludovisi 60 where you can leave your luggage. If you need to leave the luggage please contact us via email. We provide a service of transfer from / to the Fiumicino and Ciampino airports For 1-3 passengers € 55, one way For 4-5 passengers € 65/70, one way For 6-9 passengers € 75/100, one way To reserve the transfer, please send an email with details to our email address. This little place was a welcome retreat from the craziness of Trastevere. We loved the terrace and the views out over the roof tops. It's all pretty small with low ceilings and a narrow steep staircase that wouldn't work for people with mobility issues but we found it comfortable, clean and well stocked. Right in the heart of this crazy, colorful neighborhood. We would definitely go again. 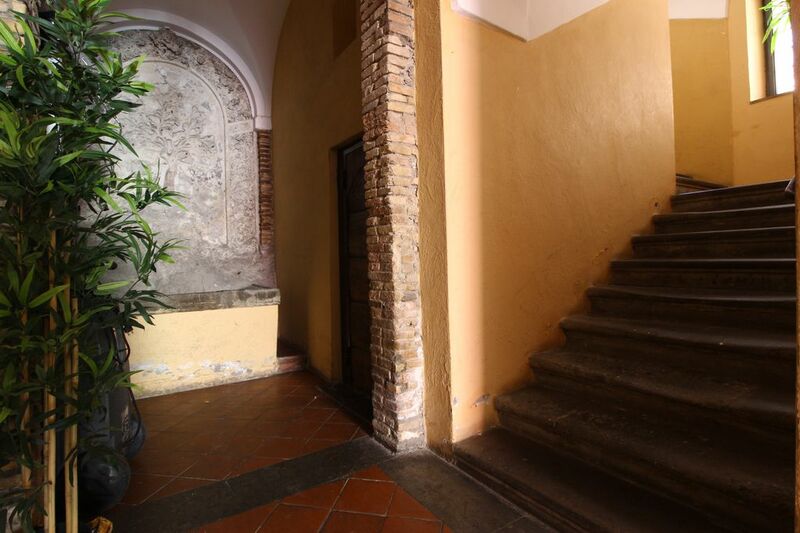 The building is a gem: thick walls, wide stone staircase, all'antica. The apartment has lovely finishes (wood floors, wooden built-in cabinets) and is artfully arranged to maximize living space; the terrace is spacious and looks out over rooftops. Despite its location on one of the busiest little streets in Trastevere, the apartment is not at all noisy. There were a few minor issues of which the management could not have been aware without someone telling them -- lights out or not working, a slow drain-- but when called, they came and solved them promptly and cheerfully. Located in the very center of Trastevere and just next to the river, the apartment is nevertheless private and isolated from the noisy night life. From here you can reach the main tourist points just crossing the bridge: Navona square, Campo dei Fiori, Pantheon, Venice square. Vatican City and Castel Sant'Angelo.